This is the third Chinese writer winning the prize after Jiang Rong in 2007 for “Wolf Totem” and Su Tong in 2009 with “The Boat To Redemption”. But there is only one translator for these three books: Howard Goldblatt, this is rather exceptional and should be mentioned. Three months ago, we wondered if H. Goldblatt was not launching a takeover bid on the MAN Asia prize !The bid has been successful ! Professional qualities of this distinguished translator are well known but there is there only one translator for novels from Chinese to English? We are happy for Bi Feiyu although “Three Sisters” is not his best book. 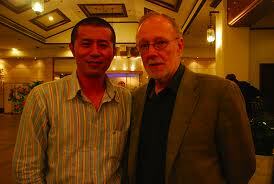 All those who’ve met him praise his straight forward character, his sense of humor, his openness and his talent …. “Three Sisters”, a loose set of three short stories: Two years ago, I presented the various novels by Bi Feiyu including a great book “The Moon Opera”, a beautiful novel about the Peking Opera and its decline under the pressure of money in today’s society and its difficult relations with cultural productions. “Three Sisters” does not reach that quality level and combines three short stories that take place separately during a ten year period from 1971 to 1981. 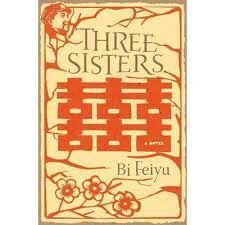 (1) Bi Feiyu – “Three Sisters” translation Claude Payen, P. Picquier 2004, 350 pages. (2) Bi Feiyu – “Three Sisters”, Houghton Mifflin Harcourt, August 2010, 290 pages.